Our intuitions about how crosslinking can increase adhesion across an interface are often wrong. For example, we would think that "more" is "better". In reality, a low level of crosslinks is ideal to give much-needed dissipation and a high level gives a brittle bond. Classic "strong" adhesives such as epoxies make it obvious that crosslinking is a good thing for adhesion. Unfortunately the opposite is very often the case. Many formulators are familiar with the addition of an extra 0.5% of some crosslinker to provide even stronger adhesion, only to find that adhesion fails catastrophically. Although crosslinking can often be highly beneficial there are at least two reasons why more crosslinking can make things worse. The first is the fact that chemical bonds across an interface can provide, at most, 1J/m2 if the failure is exactly along the line of the interface. In other words, without dissipation, crosslinking is of little use and, indeed, can make a system so rigid that no dissipation is possible. The second is when a polymer, say, becomes so strongly attached to a surface through chemical bonds that it no longer is able to entangle with the rest of the polymer. This can happen, for example, when a polymer is functionalised to react with a metal surface to increase adhesion. This means that the adhesion problem shifts from "polymer to metal", to "polymer to polymer-which-is-attached-to-the-metal". A lovely case of this has been documented by Prof Richard Wool in the case of adding maleic acid functionality to a bio-polymer adhesive designed to adhere to aluminium. Going from 0% to 1% maleic acid increased adhesion significantly, but above 1% adhesion crashed, leaving a "cohesive" failure of a thin layer of the original polymer which was stuck so firmly to the aluminium that it had no entanglements with the rest of the polymer. Because entanglement is such a powerful way to gain adhesion - any attempt to pull the entangled system apart requires many polymer bonds to be stretched to breaking point - it is worth asking what is the difference between an entangled adhesion system and a crosslinked adhesion system if the number of entangled crossings is the same as the number of crosslinks? The answer is: no difference! Magomedov's book Structure and Properties of Crosslinked Polymers makes no distinction between the physics of polymer entanglement and "real" crosslinks such as those in epoxies. Of course in terms of long-term creep and (perhaps) long-term chemical stability, crosslinked systems are stronger, but in terms of adhesion there is no difference. The Lake & Thomas formula of ΣNU emphasises the importance of N - the number of chemical bonds between entanglements/crosslinks. The larger N (so the lower the % crosslinks) the stronger the adhesion for a given cross-boundary density of links Σ. Of course you can't go too far. By reducing the total number of crosslinks one also reduces Σ. But the dissipation effect of large N is also important. So lightly crosslinked systems often show much more practical adhesion than strongly crosslinked ones. There is a big warning about lightly crosslinked systems. 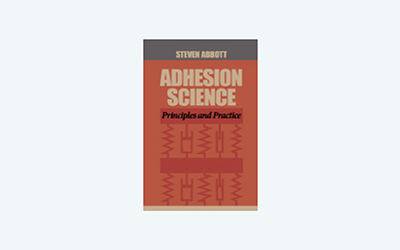 They are of no use in structural adhesives that rely on high values of E.